So, there I was, enjoying the Museum of Modern Art in San Francisco, wandering from Walker Evans to Louise Bourgeoise when I was stopped in my tracks by this work of art….. It was such a compelling piece that a complete stranger and I struck up a conversation. We were both excited about the image, (acrylic paint, pastel,coloured pencil, marble dust, transfers and custom fabric on paper) and wanted to share our enthusiasm and admiration for Wedding Portrait. If you’re interested, take a few moments to look at my photo of the artwork (which, of course, doesn’t do it justice.) Notice the shapes, the layering, the negative spaces…..it’s a work beautifully composed. It’s intriguing to have the face of the (presumed) groom absent, even though the other figures focus on him. Click here for a link to Akunyili Crosby’s website. There are many more images to savour there. The Baltimore Museum of Art opened a solo show of her work today! Front Room: Njideka Akunyili Crosby / Counterparts closes March 18, 2018. That gives us plenty of time to plan a trip to Maryland. 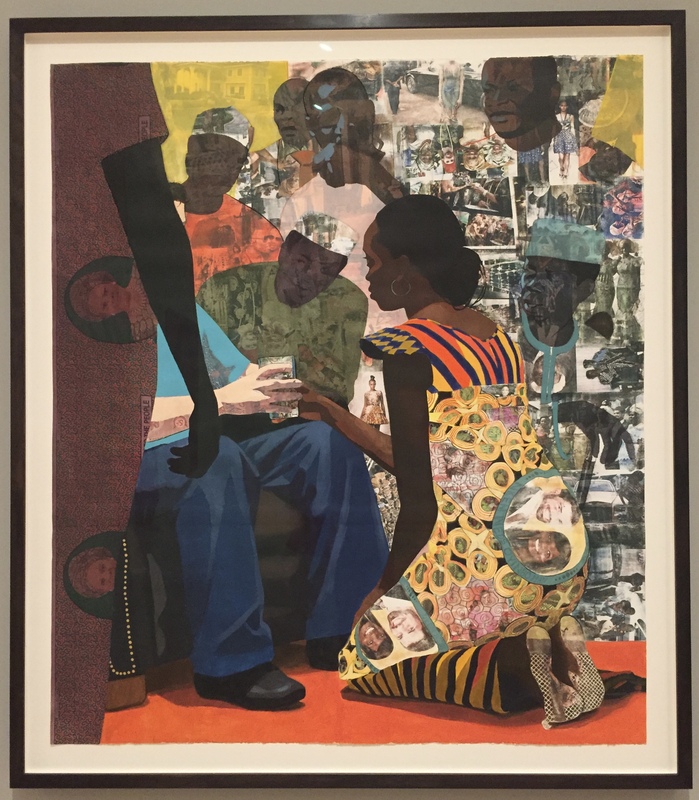 This entry was posted in Baltimore Museum of Art, Louise Bourgeoise, Nijideka Akunyili Crosby, San Francisco Museum of Modern Art, Walker Evans and tagged Baltimore Museum of Art, Nijideka Akunyili Crosby, San Francisco Museum of Modern Art on October 25, 2017 by terryvatrt.